Castle Ravenloft is the biggest chapter in the book. With over 40 pages describing the different 88 areas inside, it is a daunting task to get ready for. It’s important to have in mind that it is unlikely that the castle will be explored completely. A party might have some exploration in mind or a feeling of curiosity, but in reality, Castle Ravenloft is a place where the party will run out of resources sooner or later, and they most probably won’t long rest inside the castle. Additionally, Castle Ravenloft is not a dungeon crawl to visit all in one go. The party will have to come and go several times during the course of the module. Attend to Strahd’s Dinner Invitation. Try to find an artifact. Odds are that the party visits the castle for the first time to comply with Strahd’s invitation. The main floor is of importance here. The party sees the main entrance, are received by Rahadin and then led to the dinning room. After the meeting with the count, if they respected Strahd’s hospitality and had a civilized dinner, they could be free to go they same way they came. However if they end up fighting Strahd, they will have to escape the castle. I recommend to have the main entrance closed up and guarded by the 4 red dragons, so the party will have to look for a different way a out. Depending on the party level they will be half confident or scared, but will try to get out. They probably won’t look for a way out in the basements. Unfortunately the only other way out of the castle from the first level is in area K23, but it’s only accessible from the first basement or from the second floor if they find the secret door in area K20. They could also break their way out from the chapel windows in K15 or go up to the third level and climb down the inner wall of the castle. Since it is the first visit, Strahd only wants to play and scare them, ultimately he’s letting them escape, albeit not easily. If the tarokka reading revealed the location of an artifact inside Ravenloft, and the party has already deciphered the meaning of the cryptic message, then they are visiting the castle with a clear purpose. If this is at level 9 and that’s the only thing before leveling up to 10, then the objective might be “getting the object and then fight Strahd”, but if that isn’t the case, then the party will retrieve the object and get out. These artifacts are not unknown to Strahd, however if they are in the castle, he placed them there a long time ago and has forgotten they even exist. Preparing for this situation depends entirely in the location of the artifact and how the party decides to access the castle (more on ways to enter the castle later). 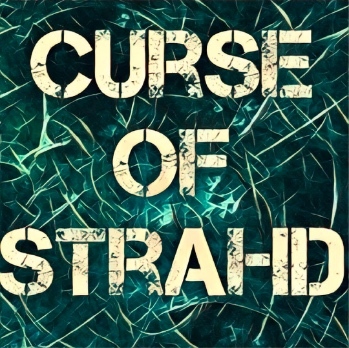 After recovering the artifact, if it is the Tome of Strahd, and Strahd learns about this, he is supposed to present a serious opposition to the party’s escape. If the recovered item is the Sergei’s Sword or the Symbol of Ravenkind, both of them can produce real sunlight, which will make Strahd reel and rethink his approach, letting the party escape, for now. Unless you choose to reveal the information or the party has already visited area K67, they will have no way of knowing the whereabouts of the dragon’s skull. If the party has access to Locate Object they will detect the location of the skull as soon as they enter the castle, though. The party can enter by the main entrance and then go down to the first basement through the stairs in area K21, and you want this, because then they would pass through area K61 where the elevator trap is, this trap will break the party and depending on party level, it has the potential to kill one or two PCs. It will derail the mission for sure. Alternatively, they can enter through the servant’s rooms in area K23 and descend to area K62 where they could find Cyrus Belview, who will also try to lead them to the elevator trap. If they survive or circumvent the trap and reach the Hall of Bones (K67), make sure you have an appropriate boss fight to prevent them from stealing the skull. Rahadin’s office is two rooms away so that’s a good option. After retrieving the skull, they need to get out fast, the skull weights 250 pounds so it won’t be an easy task. Adventurers might assume that there is a place where Strahd keeps his treasure, and they would be right, area K41 is Strahd’s Treasury. However its location is hidden. It’d be ok to assume the treasury is in the basements but this one is on the third floor, plus it lies behind two secret doors. Strahd will not easily let them reach it. One possibility is that the party finds the Ravenloft model in the Amber Temple (Area X20, page 187). They will have a visual representation of the whole castle and know where the treasury is. A good place for a tough fight before reaching the treasury is area K40 or K37. If the party is unaware of the true location, they will find the false treasury in K38 and probably assume that the true one is in a different location, probably the catacombs. Thus they would never find the treasure. Final showdown’s location is dependent of the tarokka reading. This objective assumes that the party is level 10 and has visited the castle a few times before. The party might also try to destroy the Heart of Sorrow in area K20 (top of the tower actually). Note that the location of Strahd’s Location is not the place where the battle will take place; it’s just the place where the battle will begin. 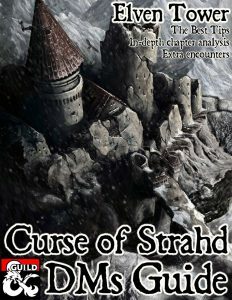 Strahd is ever resourceful and he’s more powerful when using his castle and terrain as a weapon, thus he will be moving from place to place. The battle is also a race to catch up with Strahd, who will be leading the party through dangerous places and sending tons of minions and vampire spawn to kill them. If your players haven’t gone through the elevator trap then Strahd might lead them there just for gags, and even if they have, the second ride is always better. Ravenloft looks lonely but it really isn’t, there are a couple of NPC’s currently living in the castle, most of them indifferent or aggressive towards the party. They are buried in the 40+ pages of this chapter but here’s a list of them and their locations. Rahadin, Strahd’s second in command receives the party for the dinner invitation. His office is in area K72 but he can be found in any part of the castle. Lief Lipsiege, Strahd’s accountant, he’s chained to the desk and has been here for a long time (Area K30). He can be convinced to divulge the location of the Symbol of Ravenkind. Helga Ruvak, this vampire spawn pretends to be a damsel in distress and begs for the party’s assistance to escape the castle in area K32. When a good opportunity to betray them comes (probably while attacked by other creatures) she attacks. Pidlwick’s Ghost, if a player performs well with the harp in area K36, the ghost of a short man dressed as a fool appears and talks about a valuable treasure in his crypt. If Pidlwick II is around, he blames him for his demise. Gertruda, this young woman is Strahd’s guest and plaything but not yet a vampire spawn, she’s in the King’s Room (Area K52). She is unaware of any danger and naïve to the point where she is dangerous to others. The party might feel inclined to extract her from the castle to appease her mother “Mad Mary” from chapter 3. Varushka, the harmless ghost of a maid who took her life to avoid a life of servitude as a vampire spawn haunts area K43. Escher, a male vampire spawn in Strahd’s favor. He fears Strahd is growing bored of him, however he will try to lead the party to him if possible. He can be found in area K49. Cyrus Belview, Strahd’s faithful servant who lurks in area K62, he’s crazy and devoted to Strahd. If possible he will offer the PCs to lead them to their sleeping rooms in the tower, if they comply he will lead them to area K62 and kamizake himself up with the party in the elevator trap. Pure gold here. Emil Toranescu, a werewolf trapped in area K75A, he will promptly betray the party unless they reveal their friendship with his wife Zuleika. More on this plot line in chapter 15. Patrina Velikovna, the sister of Kasimir. She is now a banshee trapped in crypt 21 (page 89). If restored to life by Kasimir she returns as an Archmage with her own agenda as priority. Main Entrance (Area K7) This is the most obvious one, however you can only pass through here if Strahd wants it. If not, there are four red dragons here to stop anyone. Servant’s Entrance (Area K23) If the party takes their time when exploring Ravenloft and circles around the inner walls, they will find the servant’s entrance. However even though it is in the main floor, it connects with the first basement and the second floor through the stairs in area K24. It is a plausible way in or out of the castle. Chapel (Area K15) The party could break their way out of the blocked stained glass windows here. The noise will attract attention though. Parapets (Area K46) From many places in the third level the party can access the parapets on top of the inner castle walls. They can climb up or down from here but it’s a 90 feet climb. Not for the faint of heart. Or they can simply brave the jump and take up to 8d6 (24) damage. Tomb of King Barov and Queen Ravenovia (Area K88) This one is tricky, because the window looking out of the tomb is 110 feet below of the Overlook (Area K6). The party can try to climb up or down, but any mistake could have them fall 900 feet to certain death. Parties with some teleportation magic like Dimension Door can make this possible for an express entry to the catacombs area. Brazier Room (Area K78 – exit only) This place has a magical brazier that can be used the teleport to some locations outside of the castle. Ravenloft is not supposed to turn into a simple dungeon crawl. Even high level parties should be careful when visiting, since resource management becomes a must. Strahd has unlimited minions to throw at them to wear them down. Even important NPC’s like Rahadin can be revived by the Abbot on Strahd’s request. Escaping the castle when resources are low or when a goal has been accomplished should always be a matter of life and death. This is a very long chapter full of information, hopefully these guidelines will help put the castle in perspective for an easier planning on an expedition to Ravenloft. I also recommend to read carefully all the different crypt’s entries and treasure whenever you anticipate the party exploring that section of the castle.